Bathing is an activity of daily living that many seniors living with disabilities may struggle with. Some may find that their current bathroom is inadequate and doesn’t meet their needs, yet a walk in tub may not fit their budget. There are smart alternatives and bathing aids that can preserve autonomy and independence. If you have physical challenges or disabilities, you know that taking a bath has some inherent dangers. First of all, a traditional tub may create a fall risk, particularly for seniors or those with injuries or limitations. What can you do? 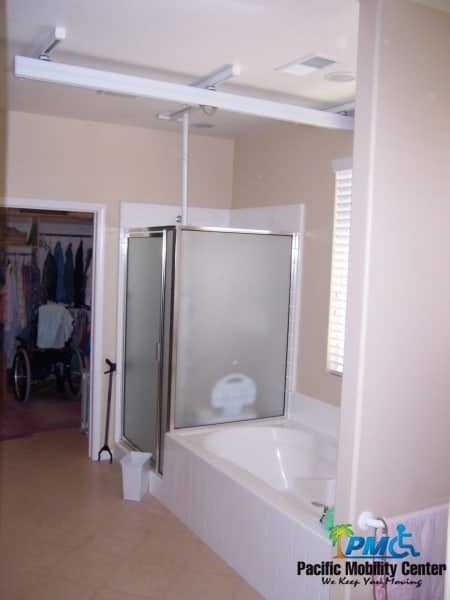 A walk-in tub is often lauded as the solution to bathing safely in the home but it may not be for everyone. Before you invest in something like a walk in tub, know your options and talk to Pacific Mobility about alternative solutions that work for you. It is estimated that around 308,000 consumers rely on the use of bathing aids or equipment regularly, and another 280,000 require these devices in addition to human support during this activity of daily living (ADL). Since bathing is critical to well-being, it could prove to be a barrier to autonomy or living independently for many. Bathing presents some serious safety issues; did you know that more seniors are injured using their tub or shower than when using any other kitchen device, including the stove or exercise equipment? There are more inherent and often-hidden safety risks in the bathroom than in any other room of the home, according to industry experts. The user must be able to shut the door in order to turn on the water, which could prove challenging for many consumers. It can be difficult to control the tub temperature with any accuracy or precision. The cost: Walk-in bathtubs can be quite expensive and many insurers may not cover the cost. So maybe a walk in tub is not for you; what are your other options? Bathtub Transfer Benches create a bridge, of sorts, over the side of the bathtub, which allows the user to scoot and shimmy across to get in the bath. It also offers support and a place to sit during bathing. Bath chair lifts can be more affordable than you may think and are remarkably easy to operate. Contrary to the bathtub bench, which works better for a shower or hand-held sprayer, a chair lift is perfectly suited to those that want to soak and submerge in a bath. A button operates a motorized seat that lowers into the water and raises when you are done. Slide-in style Bathtubs are similar but different than a walk in tub in ways. For example, these have higher walls with seats molded in them, which swing and allow the user to bathe. Basically, the operator would sit and back up and sit. Then you are able to fill and bathe as you normally would. Free standing lifts are perfect for more serious disabilities, including if you have difficulty transferring from the bed to an upright position. These can be used for other purposes, beyond bathing, which may make them a multifunctional and cost-effective solution for many consumers with physical limitations and challenges. A Shower Buddy is an excellent idea for individuals that seek support and assistance with activities of daily life, like bathing. Visit a retailer to see the wide range of styles, purposes, and models available. Additionally, you may be able to provide adequate support and stability during bathing with inexpensive aids like grab bars. These can be secured practically anywhere and are valuable when bathing, toileting, or using the vanity. Is your bathroom accessible and safe? Have you been thinking about a walk in tub, but are unsure if it is right for you? Visit the mobility experts at Pacific Mobility to find cost-efficient solutions that will fit your needs, home, and budget. Take time to try the various aids and ask for demonstrations to pinpoint the best option for your living situation. Furthermore, work with the pros who will install and repair mobility aids and equipment for you, providing ample service and support after the sale.